It prevents all flying insects from entering! Installed in front of a door, the aluminum chain curtain prevents all flying insects from entering (it acts as a mosquito net). You can leave doors and windows open without risking the invasion of flying insects! 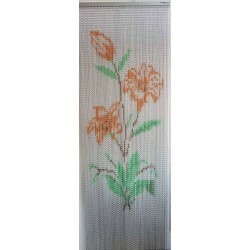 It is also ideal for homes near the sea or in the mountains, because our curtains are not afraid of corrosion. 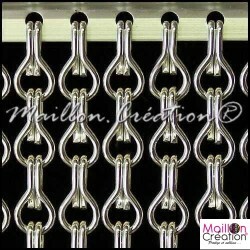 Maillon.Création® offers high quality aluminum chain curtains made in France, robust and hygienic. No risk of darkening your room, our chain curtains let in air and light. Our Curtains are custom-made and customizable to infinity, to adapt perfectly to your needs by combining elegance and practicality. The metal chain separations are light and airy, they offer an ideal decorative solution to facilitate the movement from one space to another. Thus, crossing the walls, a room appears and then disappears with each passage. You can also configure the opening of the same room to your liking, according to your specific needs of interior space (large dinner, meeting, reception ...). 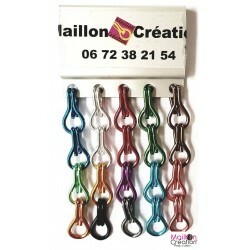 Maillon.Création® aluminum chain separations are custom-made and customizable to infinity, in order to adapt perfectly to your needs by combining elegance and practicality. Whatever your needs, the sets in aluminum chains will be able to answer them. Decorators, architects and designers use our products in their projects. Our company knows how to respond to major events, by designing original curtains and adapted to the biggest international stages! The curtains are flexible in their installation and their use; real sets of prestigious scenes. 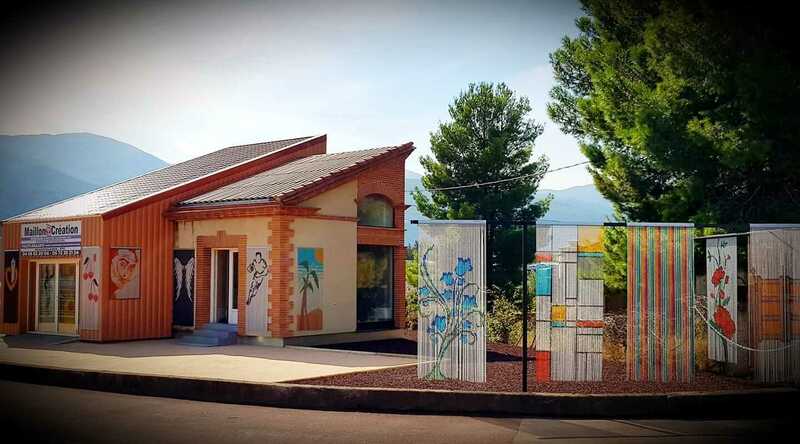 We are a French company under the trade mark Maillon.Création®, located in the Pyrénées-Orientales (in Céret) for more than 11 years and pioneer of the online sale of door curtains & decorations in aluminum chain since 2008. 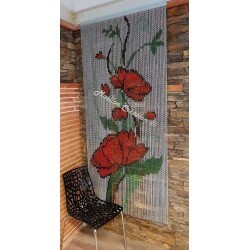 Specialized in the manufacture of curtains in anodized aluminum chains. They have better resistance to wear, corrosion and heat. Maillon.Création® offers high quality aluminum curtains robust and hygienic. We give no limit to your imagination .. Customized and infinitely customizable in our workshop "Industrial Zone 66400 Céret", our solutions adapt perfectly to your needs by combining elegance and practicality. In door curtain, no risk of darkening your room, our chain curtains let air and light but not flying insects ... They are not afraid of rain and are washable (neutral detergent). Modern and decorative, they also put an end to the vis-à-vis. 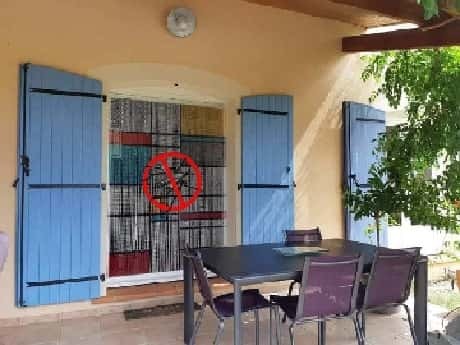 our door curtain prevents all flying insects from entering, thanks to the regular movements of the chains and the brilliance of the links (it acts as a mosquito net, a true anti-flies). You can leave doors and windows open without risking the invasion of flying insects! It is also ideal for homes near the sea or in the mountains, because our curtains are not afraid of corrosion. Door curtains are effective against flying insects, practical and less expensive than a mosquito net. 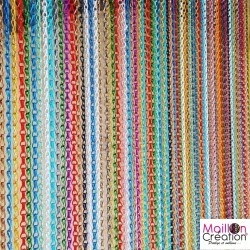 In decorations & layouts, Our solutions Maillon.Création® combine originality and purity to offer you beautiful room separations in aluminum chains. Light and airy, they offer an ideal decorative solution to facilitate the movement from one space to another. Thus, crossing the walls, a room appears and then disappears with each passage. You can also configure the opening of the same room to your liking, depending on your specific needs of space (large dinner, meeting, reception, decorations & scenic curtains ...). In scenic curtains & Scenic scenery whatever your needs, the Maillon decors. Creation® will be able to answer them. Decorators, architects and designers use our products in their projects: Scenic curtains, background stage curtains, Exhibition stands, theatrical and television sets, etc. The curtains made from aluminum chains fit.